I'm taking part in a blog circle with some other fabulous women, where each month I will include a letter to my baby boy along with a few pictures that capture the emotion and love I feel for him. I hope that you will enjoy this feature as much I have enjoyed the process, and will also take the leap to the next blog in the circle each month. 1. You love all sports on TV, and will stop dead in your tracks to cheer on whichever team has the ball or puck. 2. 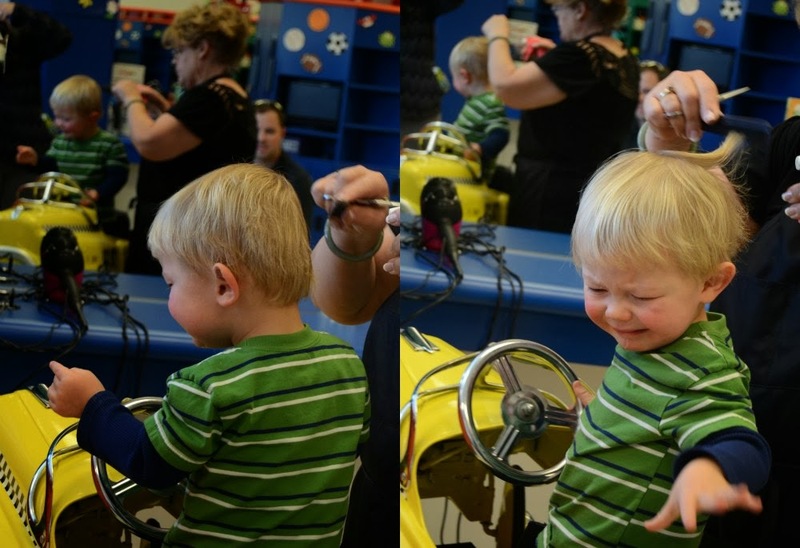 You were a champ getting your haircut the first time in Disney World, the second haircut involved a major meltdown. You look like such a big boy with your locks neatly trimmed. 3. You like playing basketball with your daddy even more than watching it on TV. 4. You are really into hugging right now. You run over to us and throw your arms around our legs if we are standing, or around our necks if we are sitting. You bury your head into our shoulders and we soak up the moment, the tenderness, the sweetest of you. 5. You are slowly learning animal sounds. So far you have mastered alligator, lion, monkey and dog. 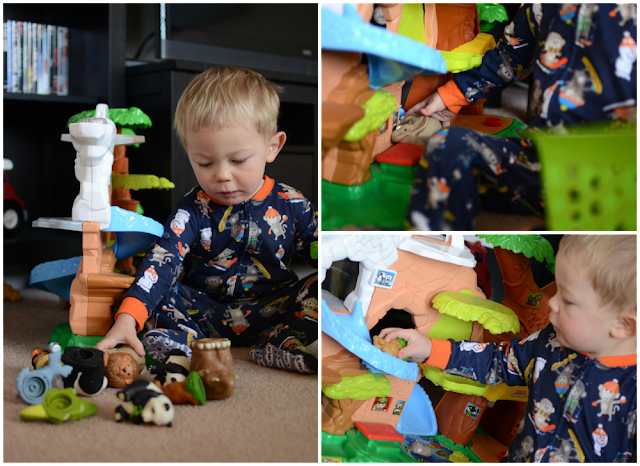 You enjoy hearing all of the animals make their sounds on your Little People Talking Zoo. 6. You are 2. Throwing tantrums before dinner has become routine the last week or so. We get home from school and you are tired, hungry, want to play, want to eat, want to sleep, want to push for independence and want to be held all the same time - the choices are challenging. 7. You like playing games on mommy's phone when you get a chance. Your favorite game is this silly little bird game where you can move the bird all around with your finger and depending where you fly and land the bird it does a little activity. 8. You are starting to enjoy playing with stickers. 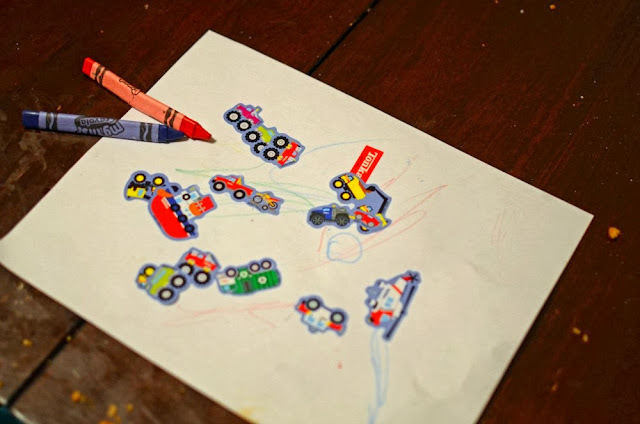 You haven't mastered how to spread them evenly across your papers, so they commonly end up in one big stack of stickers. 9. Your favorite show is Fireman Sam. It is on Sprout, from the UK, and episodes are 10 minutes long, just the perfect length for us to be able to distract you while we need to get something done. 10. You love the playground. You clap your hands and squeal with excitement when we pull into the parking lot. Swinging brings you such joy and the slide is endless fun. Although you don't like to leave the park, you understand and say "bye-bye" as we leave. Now continue on with the circle and visit Anna's blog to read her monthly letter. I love the sweetness of a 2 year old! so cute! 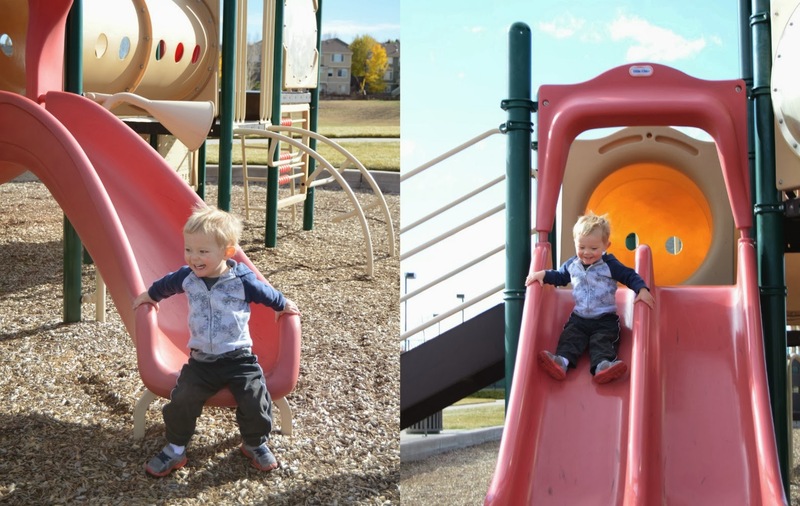 I love his smile on the slide, melts my heart!